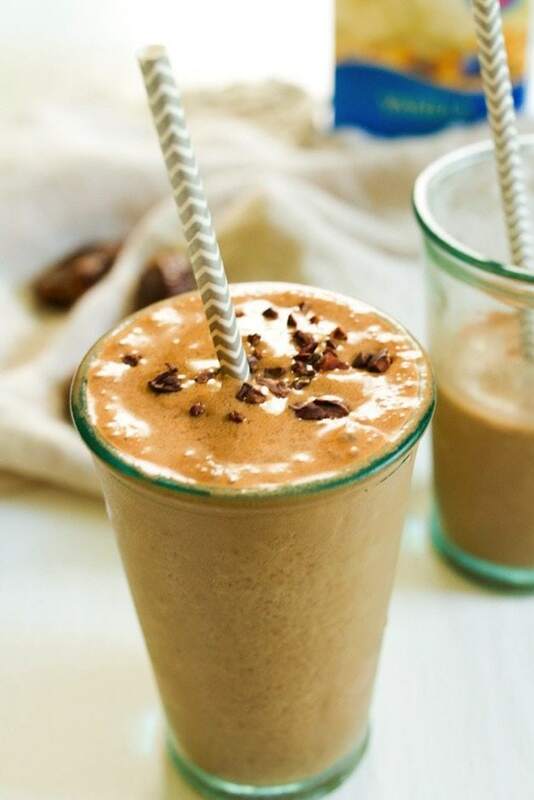 This energizing mocha smoothie is made with cold brew coffee, chocolate protein powder, cacao powder, dates and almond milk. Cool, creamy, delicious and perfect for breakfast or as a mid-afternoon pick-me-up. First off, THANK YOU for all the sweet comments on my last post. Isaac and I are really excited about our new home and hopefully (if you all are interested) I’ll have some fun home projects to share here on EBF as we start to make the house our own. Earlier this week I shared my love for cold brew coffee and mentioned I had a little recipe for ya coming soon. Well, the wait is over my friends. This here is a mocha smoothie made with cold brew coffee, cacao powder and Almond Breeze Almondmilk. 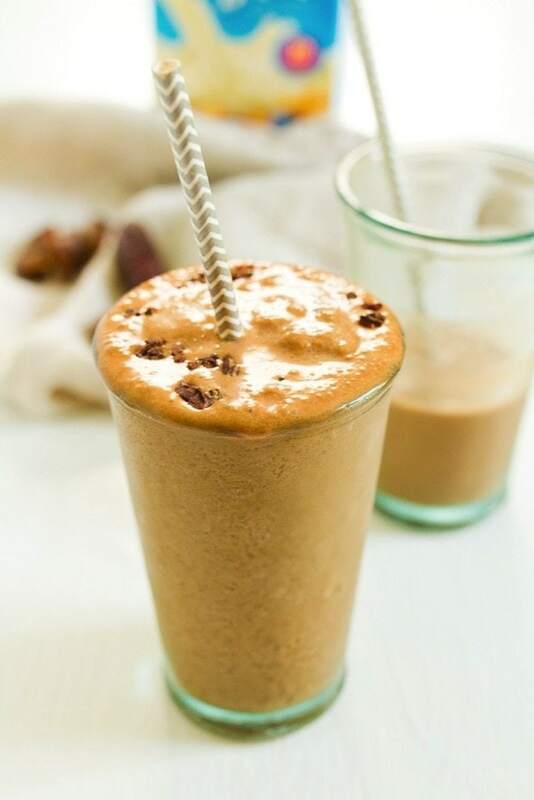 It’s like a frappe, only better for you because it’s sweetened naturally with dates and has a hefty dose of protein from chocolate protein powder. 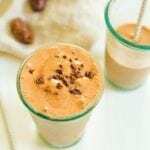 The combo of cold brew coffee and protein makes this blended drink an excellent breakfast, mid-afternoon snack or pre/post workout treat. It will cool you down and fill you up, all the while giving you a little energy boost. Woot! Plus, it tastes ridiculously delicious. Many of you will also appreciate the fact that this recipe is banana-free. I LOVE the texture of frozen bananas in smoothies and use them in almost every smoothie recipe I make. 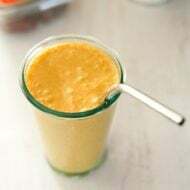 However, I do know that there are some banana haters out there that are going to be thrilled to find a banana-less smoothie here on EBF. I actually think the ice cubes work great for this smoothie. They give it that icy, frappe texture that we all love. 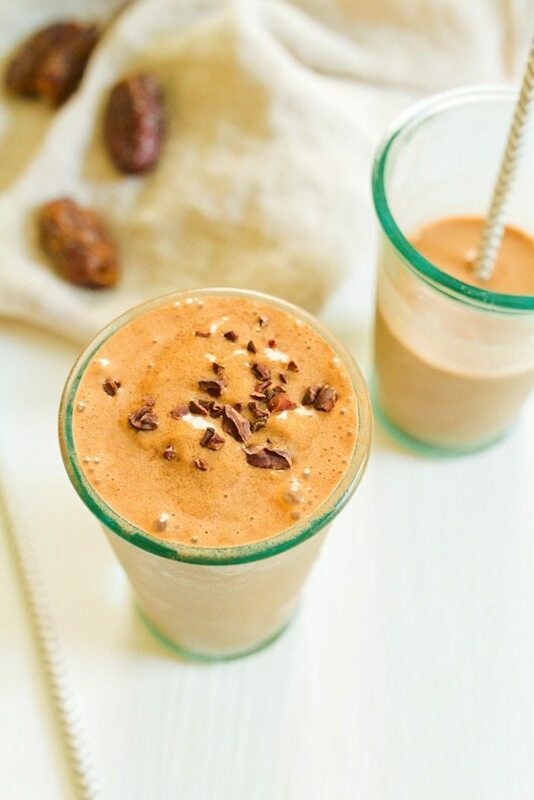 This energizing mocha smoothie is cool, creamy and delicious. Made with cold brew coffee, chocolate protein powder, cacao, dates and almond milk. Place all ingredients except cacao nibs into a high powered blend and blend until smooth. Pour into a glass, top with a new cacao nibs and enjoy. This looks delicious! I definitely want to try this! Looks great! Almond milk is such a great alternative. Would love to see some future DIY posts on EBF. Yum! Mochas are my favorite! Anything mocha and I’m in! <3 I can only imagine this tasted amazing! 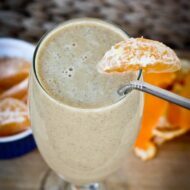 Mmmmm… I’m all about cold brew coffee so this smoothie sounds like perfection. Well those are all my favourite things in one smoothie! 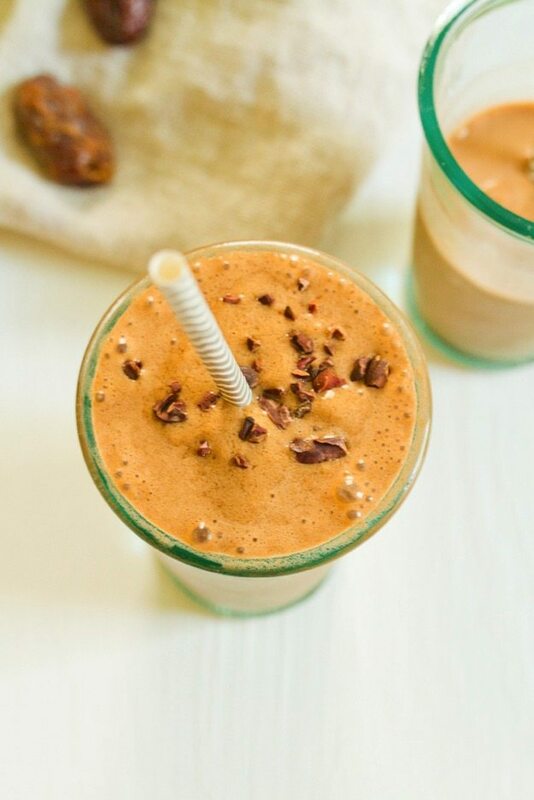 I hadn’t thought about using dates to sweeten smoothies before…where have I been!? This looks so delicious and I love how healthy it is! Cold brew is the best and making a smoothie with it is just genius! Chugging this down now – incredible! So good! Didn’t use the cacao or the nibs and it’s still fantastic (used Vega chocolate powder which is pretty chocolaty!). A winner for sure! Hooray! So glad that you liked it, Renae. I am that girl who brings 3+ jars to work in the morning! One for my smoothie, one for water and one for coffee. Luckily I’ve perfected the waitress hold when walking down the stairs to my car 🙂 Happy to trade two for one with this smoothie! Looks amazing and the perfect pick me up. WOW! That was an amazing drink!! I drank half and will take the rest to work with me tomorrow. I have a mini blender there, so I’ll add half a frozen banana and maybe some PB powder for a mid afternoon pick-me-up! Will have to try the nibs! 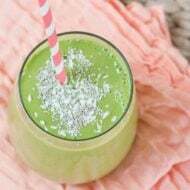 Pinned this smoothie–I can not wait to give it a try when the afternoon slump hits this summer and my kids are begging to go to the pool! This looks really good and I love the addition of cacao nibs! Congrats on your new home! I’m not a coffee drinker…but when you make it iced and turn it into a shake…I’m all over it! This looks so good! I need to make this for my mom, she would love it! I have a nut allergy and am allergic to all tree nuts. Can I use the almond milk in my smoothie? I don’t think so. Almond milk is made from almonds, where are tree nuts. I’d use another type of milk like oat, rice, hemp or even regular cow’s milk if that works for you!